The authors have requested that this paper be retracted due to an unexpected discrepancy in the data, which has led to an error in the published results. The authors believe that the discrepancy is a result of improper handling or storage of standard material of lutein. As not enough of the human milk sample is left to carry out additional experiments, it has been concluded that the paper should be withdrawn. Although breast milk is generally a renewable resource, it wasn’t in the case of this experiment: The researchers used milk from 99 women collected during a specific time-frame, along with information about their diets. The authors themselves had decided to [re-analyze] their data which were included in an already accepted manuscript. They have then retracted their manuscript because of some inconsistencies. The editors had to accept that decision. 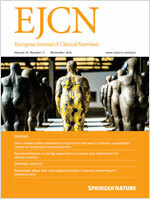 Until now the authors did not send a revised version of their manuscript to EJCN. We’ve reached out to last authors Ji A Jung, based at the Maeil Asia Human Milk R & D Center, and Namsoo Chang at the Ewha Womans University, both in Seoul, Korea. We were unable to find contact information for the first author, who is listed as H Kim at the Ewha Womans University. We’ll update this post if we receive any more information.